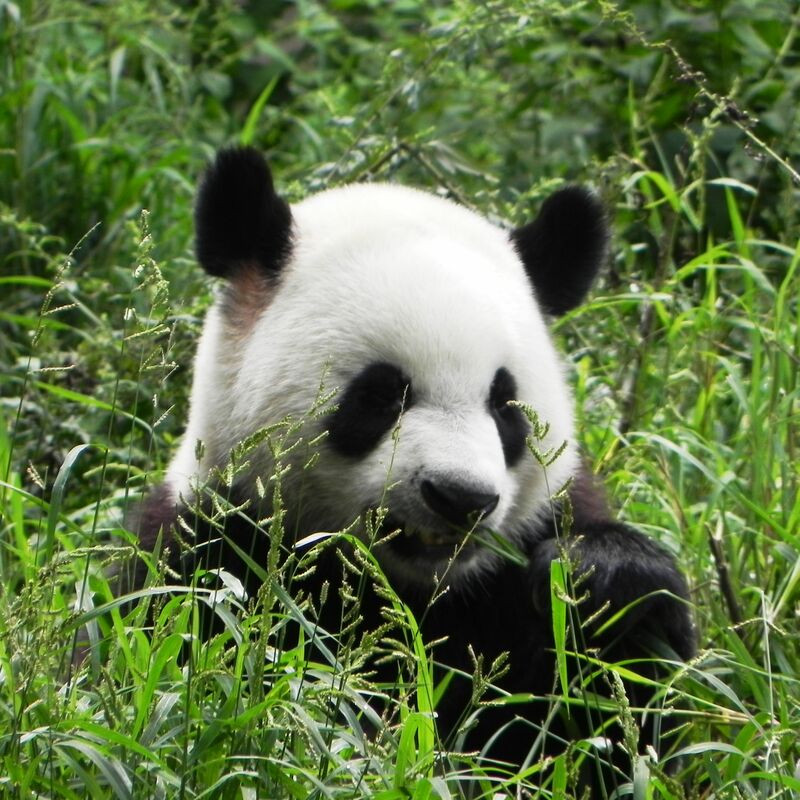 What is like to be a panda: revealing the secrets of lives of endangered panda bear species. Facts about Panda’s first year of life. Giant Pandas of less than one year old are called yearlings. Similarly to human babies the first year of their lives they undergo several important changes. At the birth panda’s baby weights between 100 to 200 grams (3 to 6 ounces) which is surprisingly very little compared to the body mass of the mother which may be between 50 to 125 kg (110 to 275 lb). It measures a mere 10 cm (4 inches). The birth may take several hours! Initially the little baby is pinkish and only after about two weeks later their characteristic black markings start to appear. After one month after the birth, panda cubs will have most of their distinctive markings – black ears, eye patches legs and shoulder bands. The cubs are born blind and toothless; it takes about 6 to 8 weeks till their eyes will open. Morning relax (yes, I'm already tired :-) and I deserve some rest. 3 months after the birth panda cub starts to take the chubby shape covered by long hairs. Also usually at that time the first tooth appears, however it takes panda about one to one and half years to have all teeth. That is why for the first year panda’s cubs diet is based entirely on mothers milk. Only after about one year they start to eat bamboo leaves. At that age they become full of energy youngsters weighting about 45 kg (100 lb). After one and half to two years of maternal care young pandas leave the mother starting their own solitary life. In the wild, if twins are born, usually only one survives. The mother picks the stronger one to feed, letting the weaker baby to die. It is commonly understood that this is due to the fact that the mother panda does not have enough of milk for two cubs. Indeed the young is entirely on the milk diet for almost one year when finally teeth are fully developed and youngster can start to feed on bamboo leaves. To make it worse – the cub nurses from the mother’s breast 6 between to 14 times a day for up to 30 minutes at the time. Unfortunately in giant panda’s case – the nature dd not leave much room for siblings! For long the Breeding Center did not have a winning strategy to keep both twins alive. The attempts to use any available milk like cow, goat and even human did not give positive results. Similarly artificial milk developed for pandas by Japanese scientists did not prove successful apparently for the lack of some vital antibody components. Twin cubs survival rate was very low. The breakthrough came from the new “trickery” strategy – making mother feed alternatively both siblings while thinking that it is the same cub. The first attempt in 1989 with Mei-Mei resulted in tragedy as mother apparently figured out the deceptive practice and went wild pouncing babies and causing their death. The second attempt with Qing-Qing in 1990 was a success. The breeder took one of the twins away by obstructing her mother’s view and brought it back later to unsuspecting mother for alternative feeding. This “natural” feeding strategy, helped with other nutritious milk supplements ended successfully with two healthy siblings growing to adulthood. Aren't these free giant panda pictures making your day? Are these pandas not so cute that smiles instantly appear on your faces? I hope that the answers to both questions are the big YES!